The Lysander was the first British airplane stationed in France during World War Two but was soon found to be vulnerable because of its relatively slow speed. Withdrawn from frontline service, this two-seat, high-winged monoplane would soon become famous for its nocturnal flights into occupied Europe, dropping supplies and agents behind enemy lines. The Lysander was built by Westland as an army co-operation aircraft at the request of the RAF. The first prototype was flown on June 15, 1936, and a contract for 144 more was signed. The Lysander began its service with No. 16 squadron of the RAF in June of 1938. The Lysander also saw service with France, Turkey and Ireland. Apart from dropping spies and equipment into occupied France, the Lysander also served as a target tug, and performed invaluable service during air-sea rescue operations over the English Channel. The Lysander was also built under license in Canada, where 225 were constructed by the end of the war. There are approximately 20 surviving Lysanders today, all but one having served with the Royal Canadian Air Force (RCAF). I've got to confess that of the 1300 plus models I've built since 1976 when I returned to the hobby, I've never built a model of a Lysander. Not sure why, but when it came time to grab one from the pile and start construction, something else always caught my fancy. It is a fairly elegant looking aircraft and has been kitted in several scales, though oddly, not for several decades. I'm thinking that the Matchbox 1/32 kit is probably the newest of the batch, with the Hawk 1/48 kit being from the 60s as is the Airfix 1/72 version. Oh, perhaps there is a short run resin kit, but nothing that I've seen of late. Thanks to those of you who reminded me of the much newer Gavia 1/48 kit! As with all Frog kits, detail is less important that ease of construction, something that made them perfect kits for kids. Should an adult want to add more to it, then he'd have to do some scratch-building. The kit has few options though there are some related to which variant you are building. One is the army co-operation aircraft so will have a rear gunner and those funny looking stub wings on which to place small anti-personnel bombs. The other is the one used to drop and pick up agents behind enemy lines. This one has a ladder on the side to allow the spy to quickly climb aboard and a long range drop tank so that it can make those flights deep into occupied territory. 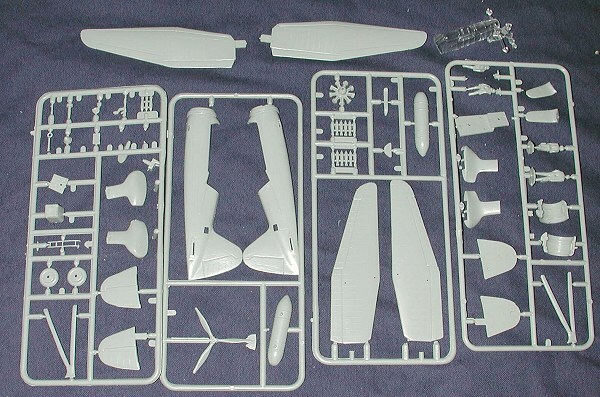 Other than those things, it is a very typical Frog kit, complete with minimal cockpit detailing, raised panel lines, the odd ejector pin marks that will have to be removed and somewhat thick transparencies. The instruction sheet is the pictorial version and mine are heavily yellowed. There are no painting instructions anywhere in the 10 construction sequences so the builder is sort of left up to their imagination as to what the inside bits are colored. A wonderful set of general construction guidelines is provided on a portion of the sheet along with some pictures to help portray the advice. The decals for this kit are heavily yellowed with age; so much so that I doubt if the 'sticking them on the window to let the sun bleach them' maneuver will have any effect. The color markings on the bottom of the box are for a Mk.I from 2 Army Co-op Squadron in France during 1940 in the standard Dark Green/Dark Earth over what seems to be Light Blue finish. 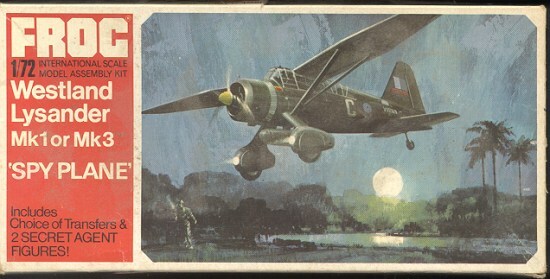 The other is a Mk.III variant of 357 Special Duties Squadron in Burma. This one has the SEAC roundels and is Light Grey/Dark Green over Black, as is appropriate for its clandestine duties. Like nearly all Frog kits, this one has probably been superceded by some resin kit over the years with a lot more detail. However, we built these kits for fun more than for accuracy and fidelity to minute detail. Though finding decals may be a concern, it is a kit that the youngster in the family will enjoy putting together.